All too soon the holidays were upon me this year. So much to do, so little time! With all the craziness of working on the renovations for our new house, the focus was on getting my retirement kitchen up and running in time for Thanksgiving, Hanukkah and Christmas. 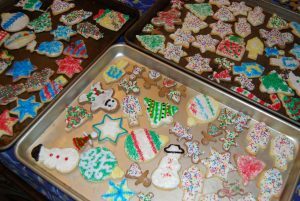 The kids were coming home and the annual holiday cookie baking had to get done. Things moved along quickly for a while. Cabinets arrived and were installed. New appliances were purchased. Then, a few weeks of waiting for the counter tops. Next came the floor that we decided to install ourselves. (Note: It’s much harder to install a hardwood floor than you might expect, and it takes three times longer than planned!) The Saturday before Christmas, the tile backsplash was put up. What a long process, but what a great relief to have a kitchen again! I am very lucky to have two amazing daughters, four “shared” international daughters (one from Japan, two from China, and one from Italy—all exchange students who have lived with us for varying times over the years), a gaggle of nieces, and a few nephews. There was a lot of girl-power happening this holiday season. 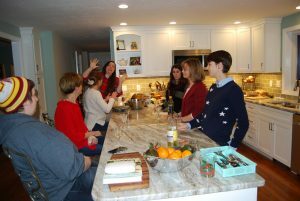 Sisters, daughters, nieces, sisters-in-law, and aunts were all in and around the new kitchen making cookies, cranberries and countless other traditional goodies. The best part of all was the conversation. Setting up a budget is critical. It is fascinating how the girls are dealing with their own money. Now that they all have some sort of paying job they are handling their own money. Turns out, they are all cheap! They hate to spend their hard-earned cash, and love coming home to mom and dad’s well-stocked kitchen that is “free”. We helped the girls set up budgets and it’s great to see how far they have taken them. They are using spreadsheets and online tools, and they are keeping up with their budgets, entering and updating them every week or so. It is important to see where the money is going (one spends too much eating out; another spends too much at the farmer’s market!) and how they are doing with their savings for emergency funds and for bigger ticket items like ski trips and more travel. An emergency fund is not an investment. A question came up about how to “invest” your emergency fund. My older daughter had been in a car accident and totaled her car (everyone was fine). She chimed in how important it was to have an emergency fund, and to build it early. That was a good move because she needed to use her fund to buy a new car and to pay for registration, plates, tags, and insurance. We talked about how emergency money needed to be completely liquid – – and that means cash. It needs to be readily accessible so it can be tapped in a moment’s notice. When you are in the throes of a major situation, you simply need the cash. Emergency funds are not investment dollars. Save for retirement in your 20s. From there, we were on to retirement savings. These are dollars that should be invested for the long-term. Two of the girls are participating in 401(k) plans at work. We talked about how important your 20’s are to building a mountain of retirement dough which is why it’s important to get started from the very first job, especially when you can take advantage of a company match. Since my younger daughter had a paid internship last summer she could save in an IRA. In fact, all the girls could contribute to IRAs, saving up to $5,500 toward retirement. They were shocked! “You mean, we have to use $5,500 of our own money and put it in an IRA?” For the “cheapsters” that was too much to comprehend! But, they are getting a clear message that it is a must-do to save for retirement and own and control their financial assets. Right now, most of them need to direct their dollars toward tuition payments or loan payments. But, they understand how important it will be to take advantage of any employer retirement savings plans when the opportunity comes along. All in all, this was a wonderful occasion to talk about money while having a great time together. The girls are interested, enthusiastic, and engaged. It’s delightful that they are frugal and watching every penny. When a strong financial foundation is laid, it makes for a good start in cooking up a secure financial future. When we were done talking money, all the attention turned to the new kitten that was walking on the table. And, to sneaking a few more cookies before dinner. The best conversations really do happen in the retirement kitchen! A really neat website by the CPAs of America includes links to financial tips and topics for talking to kids of all ages about money. You can find great information with this resource. There are any number of books about raising financially responsible kids. One review caught my eye and might be something to explore. What happens if you have amassed a lot of wealth? Do your kids know? This site offers pointers about how to talk to your kids when you are wealthy.